Smash The Mic is going balls out. 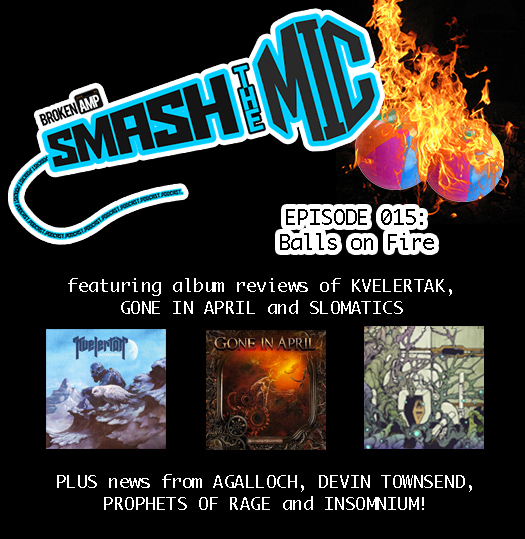 We dance along to new records by Kvelertak, Gone In April and Slomatics, while Psy taps into his love of ‘ardcore with Malfunction for Bandcamp recommendation of the week. In the news, we have the sad news from Camp Agalloch, new material from Devin Townsend and Insomnium, and interesting developments with Prophets Of Rage. Finally, we round out with a discussion on the phrase ‘a solid album’. Kvelertak – Facebook. Nattesferd is out now on Roadrunner/Indie Recordings. Gone In April – Facebook. Threads Of Existence is out now on WaveForm. Slomatics – Facebook. Future Echo Returns releases on 2nd September via Black Bow Records. Malfunction – Facebook. Fear Of Failure is out now via Bridge 9 Records.